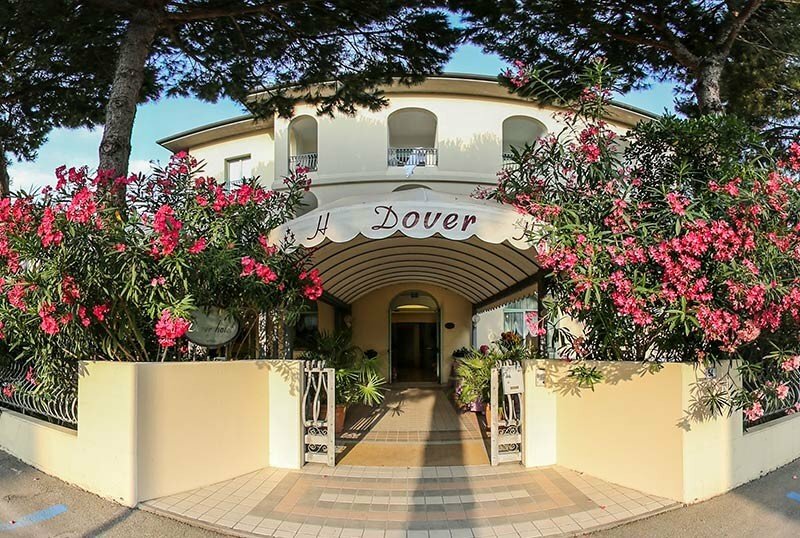 Hotel Dover is a 3-star hotel in Cervia located just a few meters from the seafront. It has a large fenced parking, sunbathing area, garden and is equipped for disabled people. Ideal for families, has free WI-FI throughout the entire hotel and outdoor playground area for children. The hotel is located in the first parallel of Cervia's seafront, one minute's walk from the beach, in a green and quiet area. The property is located in the heart of an area full of services and attractions: canoeing courses, jet skis, tennis courts, theme parks and much more. All rooms have a terrace or balcony, air conditioning, free WI-FI, satellite TV and digital terrestrial, telephone, safe, wardrobe with hangers and drawers, private bathroom with shower and hairdryer. Large garden overlooking the main promenade, sun terrace with deck chairs, free bicycles, elevator. In addition, typical dinners and theme nights are organized. PARKING : uncovered and available to all customers, also accessible to disabled people. SERVICES FOR DISABLED: entrance on the ground floor, lift for disabled people, ground floor rooms with adequate space and aids, bathrooms equipped with a shower chair and wheelchair access. BREAKFAST : international buffet and served in the garden with cakes, pies, biscuits, freshly baked brioches or cold cuts, omelettes, bacon and cheese. There is also no lack of low-calorie foods in the specially designed low-calories department. LUNCH AND DINNER : 3 menus to choose between Italian and Romagna specialties with homemade pasta and desserts. Fish menu every day; dishes always followed by a buffet of hot and cold vegetables; water and wine without limits. Weekly dinners with traditional dishes from Romagna and musical evenings with themed menus are organized. VARIATIONS : the kitchen is suitable for vegetarians and the staff prepares dishes with mainly organic products and without palm oil. In hotel : games corner in the hotel garden, afternoon buffet snack, strollers available and evening shows with puppets, teatrino and desserts. Upon request for a fee: pediatrician. In the room : bottle warmers, changing tables, cribs, safety rails for the bed and bath tubs. At meals : bibs, high chairs, baby menus, baby food, baby food and a chef always available for variations. On the beach : playground, nursery and live entertainment. The hotel has an agreement with Bagno Quinto n. 176, accessible to people with disabilities. Start the summer with a holiday in June in total relaxation! Super discounts for children up to 70%, in addition, in the room with two adults the second child is always FREE!